Making sense of the bail system in Oklahoma can be a challenge for those that have need had the need to hire a bail bond company or post bail. To help you know what to expect, the following terms are not defined in “legaleze”. We want to simplify the bail bond process by answering some common questions here. 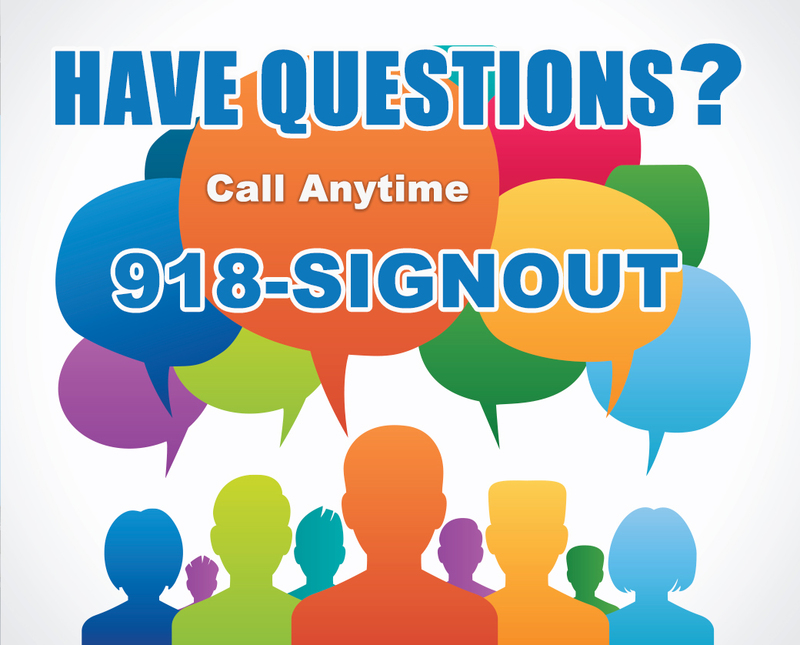 If you have any questions that are less common, feel free to call anytime (918) 744-6688. We’re here to help! An appearance bond is a guarantee that a defendant will appear at ALL court dates until a case is complete. Otherwise, there are financial and legal repercussions for the parties involved. Surety bail is a type of bail presented by bail bondmen and bail bond companies to allow individuals to be release from jail while awaiting hearing. Surety bail is the most common form of release in Oklahoma. However, there are other types of release such as: cash bail, property bail and personal recognizance. Can I Get a Discount if I Pay In Full? Yes, for qualifying bonds over $2500 with a qualifying cosigner, Signature Bail Bonds may offer to discount the premium by 20% or more. What is a qualifying bond? What is a qualifying cosigner? Cosigner can verify more than one year of employment or a home owner in Oklahoma. Most bail is made without the need for collateral. However, collateral can be used to lower the bail premium in some instances. Depending on the circumstances, the bail agent may require some form of collateral in order to write the bond. Collateral is something of value that the bail bond agency is given or assigned in order to cover the full bail amount in the event that the defendant does not go to court. Collateral is used only to secure the bond. All collateral will be returned after the bond is exonerated. Generally speaking, the higher the bail, the more likely it is that a Bail Agent will require collateral in order to reduce their risk or exposure on the Bail Bond. Collateral can be in the form of real estate, a vehicle, cash, jewelry or anything else of value. Often, the collateral must have the ability to be converted to cash within a reasonable period of time. How to Request a Bail Reduction Hearing? Sometimes when bail is set very high attorneys can request a bond hearing. At this hearing, the attorney will present facts regarding the defendants risk of flight. When a defendant has a very low risk of flight, a judge may agree to reduce bail. When bail reductions are unavailable or denied, a bail bond company may use their own risk determination to reduce the fee for bail. Ask for bail reduction from Signature Bail Bonds with a phone call to (918) 744-6688 or apply for bail online. An indemnitor is essentially a cosigner. Cosigners on bail bonds guarantee that the defendant will make all of his or her court appearances until the case is resolved. Otherwise, the cosigner is liable for any losses incurred by the bondman, bail bond company or surety. In essence, the cosigner personally backs the bond by holding the person or company posting the bond harmless if a forfeiture judgment is ordered by the court. Cosigners are also financially responsible if the defendant should fail to appear in court. In turn, the indemnitors make a contractual deal with the bail bond agency that they will assure the defendant complies with the bail conditions. This includes going to every court date on time, and they are responsible for advising or reminding the defendant to comply with dates, times and other requirements set forth by the court and the bail bond agency. A forfeiture occurs when a defendant fails to appear in court. The judge will issue an order upon the surety and bail bondsman to present the full amount of the bond in cash to the court within a specified time frame. Bond forfeiture are the “worst case scenario” for all parties involved in a bond agreement. If a forfeiture occurs, it is very important that the defendant is presented quickly to the court so the judge can set aside the forfeiture. In the event that the defendant “runs or conceals themselves”, the bail bond company will likely employ a bail enforcer (aka bounty hunter) to recover the defendant and surrender them to the appropriate jurisdiction. Misdemeanors are more serious than minor traffic infractions. They are generally classified as crimes that carry up to 1 year in jail. Most misdemeanors can carry jail time. However, if you are a first time offender, misdemeanor convictions rarely result in any jail time. A typical misdemeanor case will require 2-3 court appearances with a case lasting around 3 months. Felonies on the other hand are a more serious crime. If you or a loved one are charged with a felony offense, it is very important that you reach out to an experience criminal defense attorney. All felonies can result in jail time. However, a good attorney may be able to have the case dismissed or negotiate probation. There really are no “typical” felony cases. Some require only a few appearances and are settled quickly. Other may go on for a year or more and require numerous appearances. Being released from custody or court on a personal recognizance bond means that the individual personally guarantees that they will return to court at the appointed time. Personal recognizance bonds are approved by judges for some lesser charges or after a plea while awaiting sentencing. There are no fees for this type of release. A defendant or someone on the defendant’s behalf can place real property (land, homes or other real estate) with the court clerk to secure a bond. Property bonds are made and approved with the clerk of the court in which a bond has been set. Alternatively, when property is available but the value is insufficient to secure higher bonds, bail bond companies may be able to place a mortgage on property and make the bond at a lower fee. To qualify for a property bond discount with us, call or apply online. Cash bail is available to anyone in Oklahoma but is often times more costly. The full amount of the bond can be placed with the court to secure a bond. Generally this money if returned to the payer after all obligations to the court are met. Cash bonds are also set when defendants fail to pay court cost or fines. Bail bond companies can not assist with cash bail.